I’m fascinated by the reactions to last week’s announcement that J.K. Rowling is Robert Galbraith. I haven’t read the book. I put myself on the NYPL waiting list for it, which is now several hundred people deep. I like a good mystery, so I’m game for it. I’m also curious how long the wait list is going to get, and how long the fervor/discussion is going to last. The New York Times has a recap of Rowling’s unmasking and a story of exactly how she was discovered. From the Wall Street Journal, some insights into the way the text was analyzed. Geek.com includes a link to the software that was used in their telling of the same news. Score one for computer science! I’ve seen comparatively few “Was she exposed for stunt/profit?” angles on the story, but here’s The Guardian. Mystery writer Nancy Bilyeau, author of The Crown and The Chalice riffed on the news to raise important ideas about marketing new authors, and how readers discover new genre fiction. BookRiot suggested 5 more books J.K. Rowling should write. TIME related the story to the way the publishing industry and branding work. Tweets from @WaterstonesOxfordSt slayed me. I am still collecting interesting reactions to add to my list, so if you’ve seen anything, whether it’s thoughtful commentary or funny parody, drop me a line. I put myself on the NYPL waiting list for Cuckoo’s Calling as well. The best part was remembering that I still haven’t read The Casual Vacancy and managing to snag a copy from my local branch. When I checked it out the guy at the desk didn’t know she had written another book. This only 3 days after her identity as Galbraith being leaked and all hell breaking loose. J.K. Rowling is also a pen name. I made up the name while working on ideas for Harry Potter. “Malfoy” is an anagram for “of Amy L”…and that is me. 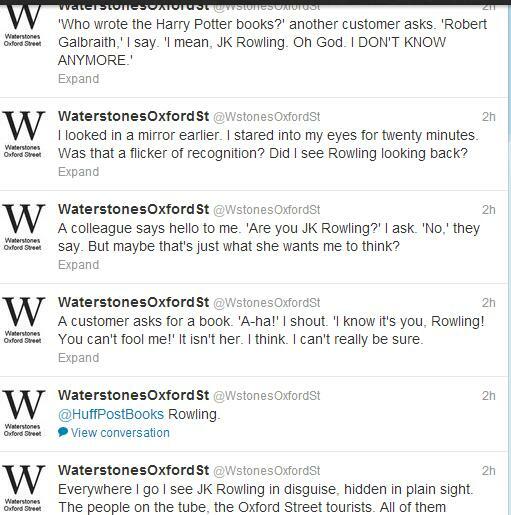 Waterstones is consistently one of the best bookish things on Twitter. I wake up every morning looking forward to the wacky things they have come up with!